This week, CoreLogic is currently tracking 1,477 auctions across the combined capital cities, and it is expected that the number of properties scheduled to go under the hammer this week will be lower than the 1,766 auctions held last week, however higher than the 1,391 auctions held over the corresponding week last year. In Australia’s two largest auction markets of Melbourne and Sydney, activity is lower week-on-week, with 683 homes scheduled to go to auction across Melbourne, down from the 818 auctions held last week, and Sydney set to host 561 auctions, decreasing from 656 auctions last week. Across the smaller auction markets, it is expected that the remaining capital cities will also see a decrease in volumes this week. 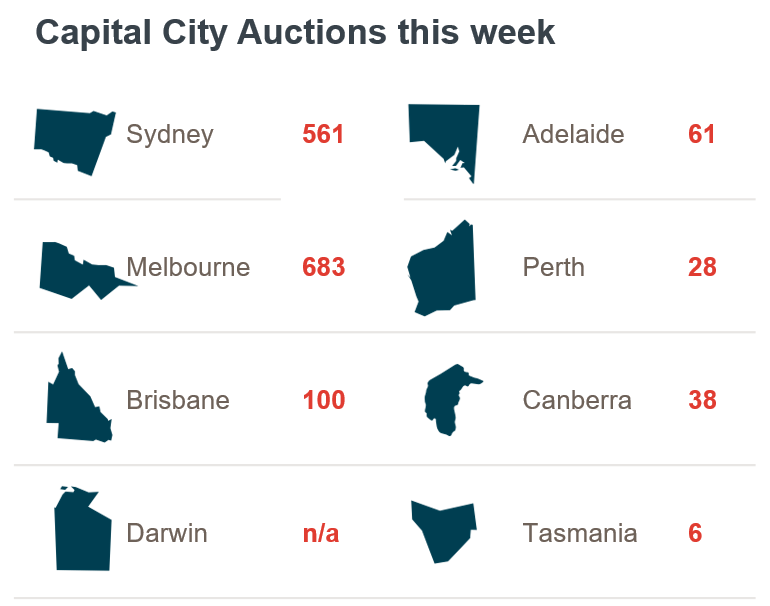 Canberra will see the most notable decrease in activity with 42 per cent fewer auctions scheduled this week compared to the week prior, followed by Tasmania (-40%), Perth (-32%) and Brisbane (-12%), while in Adelaide volumes are only slightly lower (-2%). For the second week in a row, Reservoir in Melbourne is the busiest suburb for auctions, with 15 scheduled this week, followed by Mount Waverley (14), St Albans (13), Craigieburn (11) and Greensborough (10), all of the top suburbs for auctions this week are in Victoria. The combined capital city final auction clearance rate increased to 68.4 per cent last week, up from 67.3 per cent the previous week. Auction volumes were lower week-on-week, with 1,766 auctions held last week, down from 2,001 the week prior, however higher than the 1,399 auctions reported over the same week last year. Last week, Melbourne was the strongest performing capital city auction market, with 72.9 per cent of the 818 auctions reporting as successful, increasing from the 70.8 per cent across 874 auctions the week prior. Across Sydney, 68.6 per cent of the 656 auctions cleared last week, the 5th week in a row where the city has recorded a clearance rate around the high-60 per cent mark, up only slightly from the 68.0 per cent across a higher volume of auctions over the week prior (840). Performance was mixed across the remaining capital cities last week, with clearance rates improving in Adelaide and Brisbane, while decreasing in Canberra, Perth and Tasmania. Geelong region was best performing non-capital city region last week in terms of clearance rate, with 80.8 per cent of auctions successful. While the Gold Coast had the highest number of auctions (44).